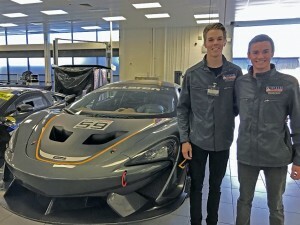 One of our tours was to McLaren GT. JUPITER, Fla. – Although it’s disappointing to have left England, it’s always nice to have the comfort and tranquility of being home. I’ve met so many wonderful and knowledgeable people along the way that I will not soon forget. From the world-class racing with over 100 very talented drivers, to our many facility visits, such as the immaculate McLaren Technology Center and many more is why it was so enjoyable. Another one of the major reasons why it meant so much to me was the immense amount of serious fun everyone would have at each event. I know I will always remember that month of my life, and hopefully soon enough I will be back over there to race again in my future. Andrew Jones looked after my car. Starting off with Cliff Dempsey Racing; they were one of the most professional teams I have been with in my career. We didn’t make any adjustments to the cars unless it was just a comfort issue for myself, and most of the time we would just end up going back to our “stock” setup. Also, after the first day of meeting the Dempseys, it felt like we had known them for months and by the end of our trip they felt like family. One of the best aspects with the team was that each mechanic actually owned each car they worked on, so I knew they wanted the car to be perfect, as did I. Adding to the greatness of the team was Michelle Dempsey’s incredible cooking. Everyone told me before I left to the U.K. that all the meals aren’t as good as the U.S. but her cooking definitely proved everyone wrong! I really can’t thank the Dempseys enough for everything they did during our month over there. The entire CDR team was exceptional. Overall, the experience being a part of the Team USA Scholarship was absolutely perfect. I know I came home a better driver and with a whole lot more knowledge of motorsports. If only more drivers could get this opportunity, or focus more on Formula Ford. Honestly, I’ve always been a little skeptical about FF racing from my experience in the U.S. running F1600, but FF in England is on a different level and I really wish more young drivers would include that into their development. The amount I learned over there in the month is the same amount I would learn in a year or more, which is why I feel so fortunate to be a part of the Team USA Scholarship program. Now that we are home, it’s time for the hard work to open doors for next year. The first course of action is to prepare for the Mazda Road to Indy USF2000 Scholarship Shootout at Mazda Raceway Laguna Seca, where Oliver and I are eligible to win $200,000 towards next year’s Cooper Tires USF2000 Championship Powered by Mazda.